Written by Pattizo Humphries, founder and active volunteer. 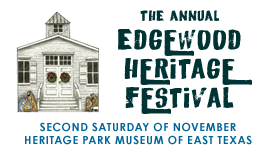 The Edgewood Heritage Festival is sponsored by the Heritage Park Museum of East Texas, previously known as the Edgewood Historical Society. This is a story about how it all began. 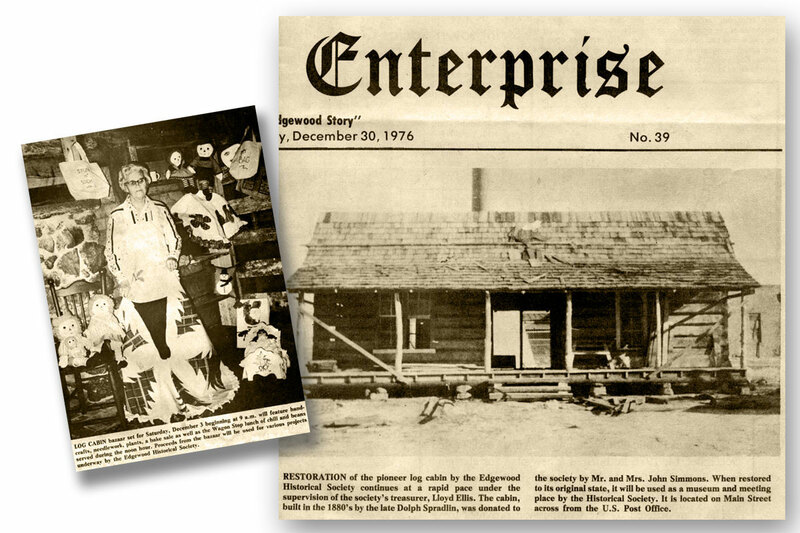 By December of 1976, the Historical Society was fully organized and in need of funds to move its first structure in the park, the Spradlin dog-trot house, to its future home on a rented lot from the City of Edgewood. A Christmas Tour of Homes and a Santa House was held as the fundraiser resulting in a net total of $320.00! After the dog-trot was moved and restored in 1977, the group’s historian, Marge Whitmire, suggested a Christmas bazaar in the cabin. She suggested each member contribute hand-made items along with a few baked goods and advertise the event through the local newspaper as well as word-of-mouth. The event was named Log Cabin Christmas Bazaar and Lady J. Wright was the first bazaar chairman. Enthusiasm was sky high with a total commitment from the members. The first weekly workshops were held in the Edgewood Methodist Church where scissors, needle and thread, hammers and paint were put in use to make one-of-a-kind items. The Bazaar was held on December 3, 1977, which netted almost $3,000.00! This early beginning evolved into a yearly tradition. As the museum expanded with additional buildings and lots, the bazaar also expanded with new ideas and energy given by the constant addition of new members. By 2008, the event had grown from just a bazaar to a full blown festival which involved the entire community. The Historical Society relented to change and renamed the event to the Edgewood Heritage Festival to be held every second Saturday in November. Among the early additions was the pinto bean contest which actually began in a log wagon stop by the dog-trot cabin. After being judged, the beans, cornbread, along with chili were sold to hungry bazaar goers; thus, the beginning of the present day pinto bean contest and the food court. Another early-day event was the Christmas raffle. The first raffle was a handmade “crazy” quilt donated by a Mrs. Foster and won by Christine Kidd. Many different things have been raffled since, from a black angus steer donated by D. L. Keeney to Tony Lama boots donated by Herb Ellis. Time changes as this year’s raffle is $500.00 cash! The gourmet bake sale’s humble beginning was held in the log barn lot. Chairman Sally Pickens displayed the various baked goods on bales of hay and she served tasty samples from a silver tray! The bake sale eventually found its permanent home in the restored Gilliam Station which was completed in 1995. The popular tradition of annual Christmas ornament was introduced by Wynelle Pickens Knackstadt in 1991. She made about forty wooden Christmas trees decorated with personalized red wooden disks. Each year following found the membership painting 150 ornaments Christmas subject for the bazaar. In 2004, the members elected to begin presenting one of the restored buildings in the museum as a subject for the popular fundraiser and this created a true following of collectors who eagerly await each year’s edition. A Classic Cars Show chaired by Stephen and Marianne Goode has developed into a major car show and attracts hundreds of car enthusiasts to the main streets of Edgewood on Festival day. An Antique Tractors show chaired by Lee Thornton was added a few years later and this has grown into another eagerly awaited event by many. New additions to the festival is Mini Bikes Drag Race. All these exhibits keep the visitors busy along with the variety of art and cultural demonstrations, entertainment, vendors, parades, and many more. All proceeds benefit the museum which is a village of 22 circa 1900 authentically restored and furnished buildings representing early life in rural East Texas. It is a treasure for present and future generations to visit and study their heritage.